We’ve written several times on this blog about Bassel Khartabil, the Syrian Creative Commons community leader who’s been imprisoned since March 2012 without having had any charges brought against him. Is the VP/HR aware of the ongoing imprisonment of Bassel Safadi Khartabil? If so, has she issued any public statement on the matter? Does she agree that this represents a further abuse by the Assad regime in its attempts to block the free spread of information? Will the VP/HR use the leverage available to her to press for his release, insisting upon his status as a non-combatant whose only crime has been to oppose censorship and promote the freedom of information? As Cathy wrote in her piece on Bassel for Huffington Post, “For Bassel and others around the world who fight for open, a free internet is not a theoretical matter. 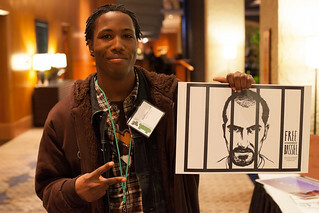 Real lives hang in the balance.” Creative Commons’ wish for 2014 is for Bassel to be freed and rejoin our community.